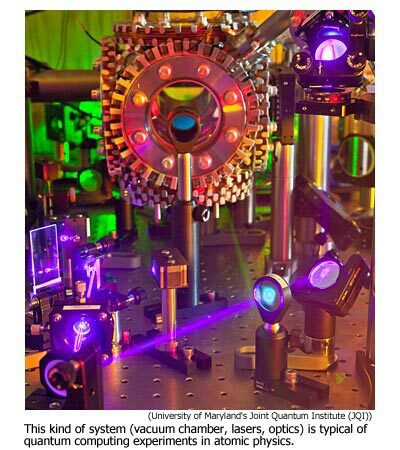 Quantum Computing: The Next Information Revolution. | Good News Everyday! Curiosity drives humanity. When confronted with a new phenomenon, we are compelled to search for understanding. We can then control the science with new technologies, making life easier. This, says AAAS Fellow Raymond Laflamme, grants us time to be curious. In the rapidly evolving field of quantum computing, curiosity over the last hundred years has driven scientists to the brink of controlling this once exoticworld. Quantum computers, with the capacity to complete in an instant calculations that a classical computer with all the time and energy in the universe could never solve, will propel the next information revolution. Yet the concept of quantum computing is young and, so far, no scientist can predict with certainty when that revolution will occur. For one AAAS fellow and his team of researchers, the missing tool to jump-start this revolution may be found in diamonds. Observations and theories in quantum mechanics have led to stories of subatomic particles breaking all known laws of classical physics, essentially walking through walls, teleporting across vast distances and traveling back in time. Quantum particles can occupy two states at the same time. Incredibly sensitive, their characteristics change in the simple process of observing them. Yet in measuring the interactions of particles with higher mass, experimenters can calculate minute energy fluctuations, allowing a better understanding of this quantum soup. “Quantum mechanics tells you that the quantum [computing] bit or the quantum coin can be both tails and heads at the same time. And this is really changing how the world works,” says Laflamme, the executive director of the University of Waterloo’s Institute for Quantum Computing. An early scientist to envision a computing system to harness the nature of quantum physics, Richard Feynman, a renowned physicist and mathematician, suggested in 1982 that the strange ability of quantum particles to occupy multiple states—known as superposition—would theoretically allow for parallel calculations. The idea presented a method far more efficient for solving certain problems than the linear factoring system of classical computing that is based on 1s and 0s. Yet this pursuit has been obstructed by defects found in the nanostructures of traditional computers—imperfections magnified exponentially on the quantum scale. This led physicists in the field to scoff at the idea of being able to contain and control these particles. In five years—a comparative leap in the long history of quantum research—that thinking changed. “So all of the work culminated in roughly the year 2000. And with control came new technologies. Every two years the number of transistors on a computer chip doubles, according to the famous observation known as Moore’s Law. In shrinking the size of transistors, processor manufacturers can fit more computing power into a smaller space, enabling new technologies like smart phones and ultralight laptops. Yet these electron transistors can only be so small before fans can no longer cool them. The end result is overheating and melting. One such material is diamonds. Rather than being plucked from the earth, this type of diamond is synthesized in a lab: Chemical vapors deposit single crystal fillings to make a strand large enough to be applied in experiments. The defects in the diamonds—the missing atoms—trap the electrons, allowing Awschalom and his team to study these particles and the interference on their spins that is created by other particles, by other spins, by molecules and a number of other interactions. The scientists can also manipulate the spin of the particle using ultra high-frequency circuits. The spin direction, in this way, counts as a point of memory. Through superposition, multiple points of memory can be recorded. Each of these particles represents a single quantum bit, or qubit. By lining up about 20 to 50 qubits, scientists can perform searching and sorting algorithms—the equivalent of matching a single phone number in a New York City phone book. In 1994, Laflamme faced a growing concern in the field he then studied, quantum cosmology. How could you factor in the distribution of the universe when so much quantum noise is interfering with every interaction of every particle? Quantum computing, as it turned out, was dealing with the same hurdle. To better understand this issue, Laflamme’s mentor sent him to a conference that year on quantum computing. As it turns out, this became the catalyst for Laflamme’s sudden emergence into this growing field. The speaker, a professor at the Massachusetts Institute of Technology, was Peter Shor. This is one mathematician who proved that in principle a computer based on the laws of quantum physics could factor large numbers, which is the basis of all our cryptography,” says AAAS Fellow Steve Rolston, co-director of the University of Maryland’s Joint Quantum Institute. Shor’s algorithm predicted that a quantum computer could find all the prime factors of a given integer and it could do it far faster than a classical computer ever could. Overnight, the encryption method used for banking systems, online shopping and myriad other code-based networks, became immensely vulnerable. The fact that it was impossible to factor large numbers in this way now stood in doubt. “Suddenly the attention came to the NSA (National Security Agency),” recalls LaFlamme. “And then they started to say, ‘Is that really true? Is that guy Peter Shor a crank or is he a real scientist?’” If all the encryption the intelligence agency has been using will now be in jeopardy, he says, they want to know when it will happen—when a functioning quantum computer will be built. With the subsequent boon in funding for quantum research, scientists from an assortment of fields grew fascinated with this emerging science. The field is now redefining what information is and how it will be delivered. The first likely technology to result from the manipulation of sensitive quantum states will be sensors. In fields like chemistry and biology this could lead to extraordinary advances in imaging the nuclear structure of proteins, changing the way pharmaceuticals are designed. In time, a machine to capture the immense information capacities of the mysterious quantum frontier may one day fit inside a shirt pocket and will enable humanity to build technologies that top scientists in the field have yet to dream up.